It is Alive! …and totally gorgeous. We are actually talking about Sean Ashe and his Axe—the Ande he played at the NAMM Show performances. Let’s look in depth at what it is and why he chose it. Editor’s Note: You can view details and pictures from that performance in the last edition of Guitar Tales by clicking here. Sean elicited the services of his Guardian Angel for NAMM Show play. Angel is our 24 fret guitar with a gorgeous exotic wood-topped body, while the word “Guardian” in the name denotes the presence of pickguard styling. So then, Guardian Angel is an awesomely-gorgeous and exotic, 24 fret, jet-fast playing guitar identified by its distinguished pickguard styling. Sean specced out his “Guardian” with a Flame Maple top and Basswood-backed body. 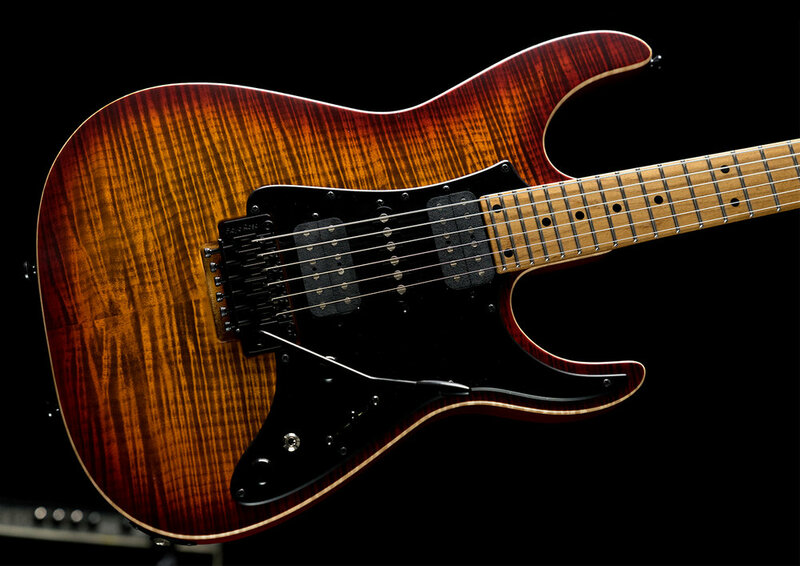 He chose Basswood for its even tonal attributes and innate ability to focus a humbucker’s ample midrange. “Okay then…,” we explained, “Yes, we do tend to name many of our options after food but it doesn’t mean you are to actually place them into your mouth. 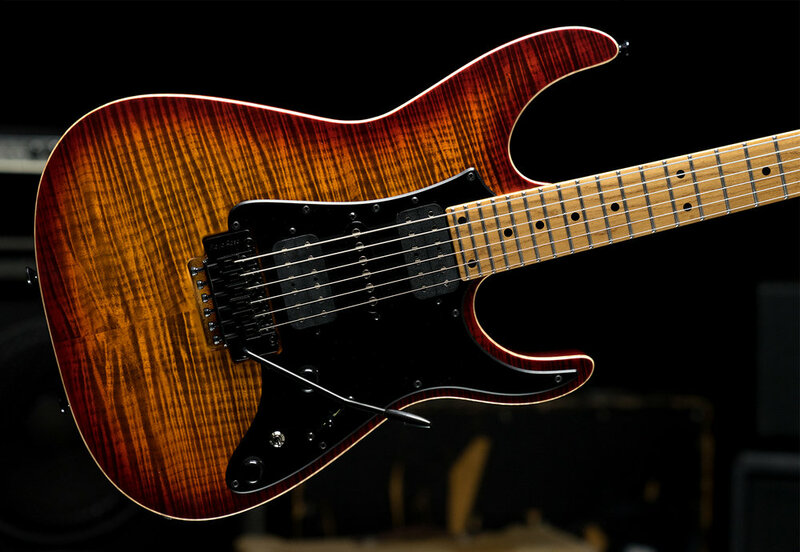 We choose those names to exemplify color choices.” He laughed and assured us that he chose Caramel Maple for its “caramel colored” look and for the liveliness and tonal control that an all-maple neck presents. 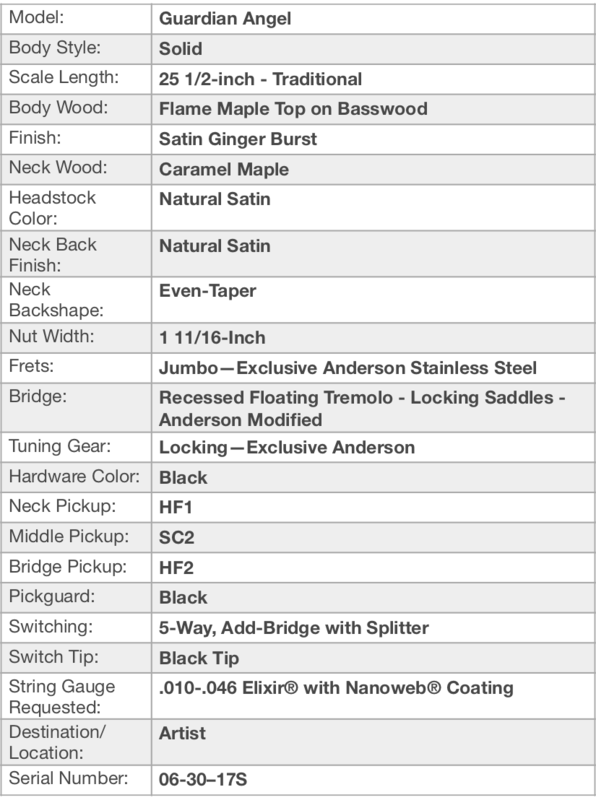 The bridge selected is our Recessed Floating Tremolo - Locking Saddles. Affectionately known as “Baby Floyd” to many of our players. This is the very best way to float a vintage-sized tremolo bridge and have it work super-well. Yes, responsibility for this Guardian Angel’s stunning good looks firmly rests on the shoulders of its flame maple top that has been garnished with a beautiful Satin Ginger Burst finish. Sean actually inspired the origination of the color when he asked us to do the shade on his first maple-topped Angel in 2014. And now for this Guardian, he opted for a gorgeous Satin version to bring out its softer shine. And even more fun: Just completed and pictured in Anderson Guitarworks Final Assembly, Guardian Angel being run through one of its many test plays with Anderson’s own Iain at the helm. Iain is an amazing guy and one of the illustrious Final Assemblers here at Anderson Guitarworks.